Two open data related publications I’ve been working on have made it to the web in the last few days. Having spent a lot of the last few years working to support organisations to explore the possibilities of open data, these feel like they represent a more critical strand of exploring OGD, trying to embrace and engage with, rather than to avoid the tough questions. I’m hoping, however, they both offer something to the ongoing and unfolding debate about how to use open data in the interests of positive social change. The first is a Special Issue of the Journal of Community Informatics on Open Government Data (OGD) bringing together four new papers, five field notes, and two editorials that critically explore how Open Government Data policies and practices are playing out across the world. All the papers and notes draw upon empirical study and grassroots experiences in order to explore key challenges of, and challenges to, OGD. Nitya Raman’s note on “Collecting data in Chennai City and the limits of Openness” and Tom Demeyer’s account of putting together an application competition in Amsterdam explore some of the challenges of accessing and opening up government datasets in very different contexts, highlighting the complex realities involved in securing ongoing access to reliable government data. Papers from Sharadini Rath (on using government data to influence local planning in India), and Fiorella De Cindo (on designing deliberative digital spaces), explore the challenges of taking open data into civic discussions and policy making – recognising the role that platforms, politics and social dynamics play in enabling, and putting the brakes on, open data as a tool to drive change. A field note from Wolfgang Both and a point of view note from Rolie Cole on “The practice of open data as opposed to it’s promise” highlight that any OGD initiative involves choices about the data to priotise, and the compromises to make between competing agendas when it comes to opening data. Shashank Srinivasan’s note on Mapping the Tso Kar basin in Ladakh, using GIS systems to represent the Changpa tribal people’s interaction with the land also draws attention to the key role that technical systems and architectures play in making certain information visible, and the need to look for the data that is missing from official records. The Rhetoric of Transparency and its Reality: Transparent Territories, Opaque Power and Empowerment puts power front and centre of an analysis of how the impacts of open data may play out, and Jo Bates “This is what modern deregulation looks like” : co-optation and contestation in the shaping of the UK’s Open Government Data Initiative questions whether UK open data policy has become a fig-leaf for marketisation of public services and neoliberal reforms in the state. 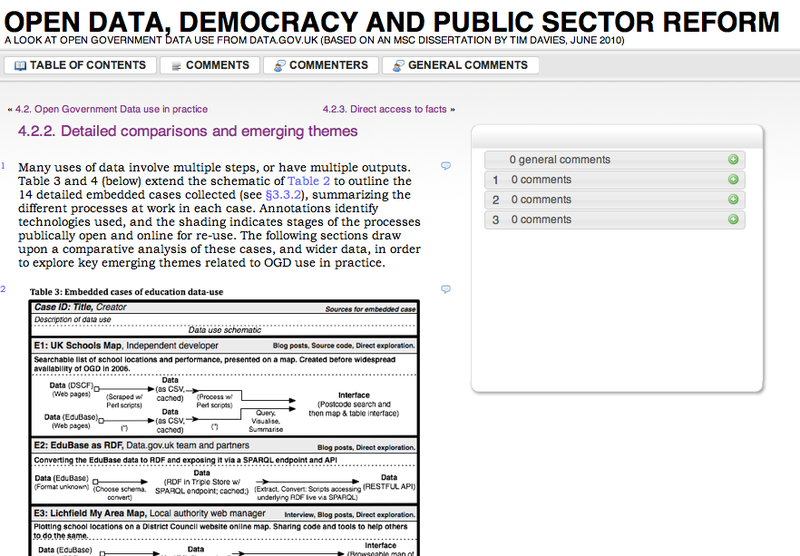 These challenges to open government data, questioning whether OGD does (or even can?) deliver on promises to promote democratic engagement and citizen empowerment are, well, challenging. Advocates of OGD may initially want to ignore these critical cases, or to jump straight to sketching ‘patches’ and pragmatic fixes that route around these challenges. However, I suspect the positive potential of OGD will be closer when we more deeply engage with these critiques, and when in the advocacy and architecture of OGD we find ways to embrace tough questions of power and local context. More to come: I’ve been working on the journal issue for just over a year with my co-editor Zainab Bawa, and at the invitation of Michael Gurstein, who has also been fantastically supportive in us publishing this as a ‘rolling issue’. That means we’re going to be adding to the issue over the coming months, and this is just the first batch of papers available to start feeding into discussions and debates now, particuarly ahead of the Open Government Partnership meeting in Brasilia next week where IDRC, Berkman Centre and the World Wide Web Foundation are hosting a discussion to develop future research agendas on the impacts of Open Government Data.